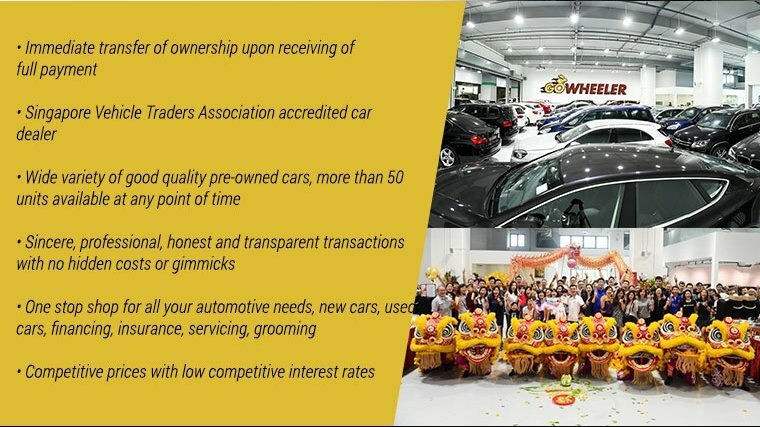 GOwheeler Pte Ltd was founded by a team driven by a strong passion to provide high service standard to all of their customers. Launching their brand with a 8,084 sqft showroom at Carros Centre, Singapore largest automobile hub, their wide range of services include buying and selling of new cars and used cars, competitive interest rates for vehicle financing through banks and financing institutions, competitive insurance quotations from reputable agencies, vehicle repair, servicing, paintwork, grooming and detailing. All of their vehicles undergo comprehensive checks to ensure the drivability and road worthiness for their customers. With more than 12 years in the automotive industry and training from main distributors of different brands, GOwheeler strongly believe in giving customers hassle free deals and peace of mind without any hidden costs. Their team of professionals provide detailed guidance from the start of your purchase till you own the vehicle and future aftersales support. Providing a wide range of selection from brands such as Audi, BMW, Citroen, Chevrolet, Ford, Honda, Hyundai, Infiniti, Jaguar, Kia, Land Rover, Lexus, Mazda, Mercedes-Benz, Mini, Mitsubishi, Nissan, Subaru, Toyota, Volvo and Volkswagen, buyers are spoilt for choices at our showroom. If buyers still can't find what they want from our list, kindly inform their friendly Sales Consultants, they will always do our best to source and recommend the right vehicle to suit you. Every staff at GOwheeler follows the same mindset, we believe buying a vehicle is a big commitment and it is not a one-time business, they hope to have you in their family and let them serve your family and friends for as long as you allow them to. Find time to visit time showroom at 60 Jalan Lam Huat #01-03/04/39 Carros Centre Singapore 737869 or call them at 6931 1212 and allow their friendly Sales Consultants to assist you in your next purchase.